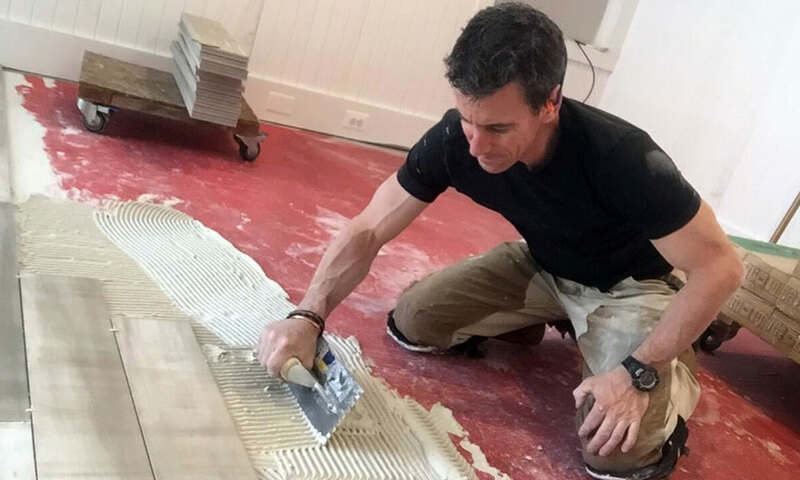 Mark Clement lays down adhesive for the tiles. Laying tiles can be very cost-effective and is an easy solution for anyone who wants to take on a flooring project. Timothy Dahl, the DIY editor at PM USA, chats with Mark Clement from MyFixItUpLife to find out how he suggests home owners can get the best results. In most remodelling applications we use floor leveler to flatten the floor, not make it level. If your floor has deep pocks or indents more than a 6 millimetres, mix up some floor leveller and pour it on. The key is getting the right viscosity: A little more viscous than water—but not much. It needs to be fluid enough to flow so gravity can draw it into a low spot. Strike off edges with a flat trowel. Kneepads: They’re ugly, nearly always uncomfortable, and hot. They’re also 100 times better than kneeling on your bare knees all day. Trowels: Use a margin trowel. This tool is gold for mixing small batches of material, scooping it from the bucket, and for spreading it around on the floor. Also use a notched trowel. Large format tiles like a large format trowel. Use a flat edged trowel to screed a layer over the floor before combing it out. For plank tiles, comb the adhesive perpendicular to the tile length. Saw: A high-quality wet cutting tile saw is the only game in town. There’s no such thing as one that doesn’t spray water so set it up inside where it can get wet and you can clean it up without wrecking things. Tile doesn’t move, but everything around it does. Basement floors, walls, and counters, can shift. Use a waterproof crack isolation product. It’s similar to using rosin paper under a wood floor; a (US) product called RedGard is a ‘bond-break’. If the slab moves the RedGard flexes under the tile. It’s also waterproof and helps keep moisture and humidity from groundwater in check. It’s ideal for bathroom and wet service renovations too. To apply, simply roll on with a paint roller and let dry. With a few exceptions, the first row of tiles should be the same width as the last row—no matter what the size of the room is. The bigger the room, the harder this is. And the more criteria there are, like notches around room features, the more you’ll need to think and plan ahead. Use a visible laser to cast a line, then measure the rest of the room, make small adjustments, and finally snap the final layout line in chalk. Your adhesive mix should be about as thick as peanut butter. When you comb it with a notched trowel, it should flow but still stand up. The reason to test for thickness is that tile is pressed into the standing seam of the adhesive. As the adhesive squishes behind the tile, that’s what adheres the tile to the floor. Mix it too watery, you risk having to replace a tile in a finished job. Also, a paste-like consistency enables you to “back-butter” a tile. Back-buttering is adding adhesive to the back of the tile and the floor to make up for a tile that is setting too low compared it its neighbours. Things on wheels move easier. Build carts and roll supplies whenever possible. They are great for mixing adhesive. Make a bridge to literally keep from tiling yourself into a corner. On one end a carpenter’s cart (lock the casters). On the other, a bag of adhesive. When you run out of room, simply end the day and walk across the bridge out of the room and finish the final tiles the following day. This article was originally published on Popular Mechanics USA.